This is the best Cellular phone Net 10 Wireless currently sells Compact, flip phone design, Single Bright color screen, Text messaging, Voice Mail, Caller ID, Call Waiting, 20 pre-loaded polyphonic ringtones and downloadable ringtones with Motorola’s I-Melody ringtone composer, Excellent battery life with up to 400 minutes of talk time and 300 hours of standby time, Preloaded games, pictures, wallpaper and screensavers, iTAP predictive text entry for messaging, Weighs just 3.1 ounces, Other features include alarm clock, calculator, currency converter and stop watch. This phone is a GSM model that requires a Sim card to work. The Sim card is provided by Net10 when you purchase the phone. This phone does not work on a CDMA network. Get wireless rates of 10 cents a minute with Net10! No contracts! This is their Basic phone. It works great and is often available for Free refurbished with a purchase of 300 minutes. The Built-in flashlight is really handy. This phone at the top of my list for a candy bar style CDMA phone. Nothing fancy with this phone but with it's long battery life and small size I like this phone. This phone is a little fancier than the Nokia 1100, it has a color screen and a built in Speaker phone. I wouldn't pay much more for this than the 1100. Compact, ergonomic and stylish Bright color screen 20 pre-loaded polyphonic ringtones and downloadable Preloaded games, pictures, wallpaper and screensavers. A basic phone that works well. 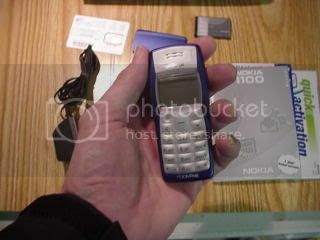 I like the feel and size of the Nokia 1100 over this phone if you are sticking with a candy bar style phone. Now Net 10 Flip Phones come in three flavors. The 3 current flippers are all from Motorola. The V170 is available both Refurbished for $39.95 with 300 minutes(this is an outstanding deal) and New for $79.95 with 300 minutes. The V171 is the newer version of the V170 but I haven't been able to find a difference. The V176 is their only flip phone that has a built in Speaker phone. If I had to choose I would definitely go with the speakerphone. For almost every user I would recommend a flip phone. I have used a few different Candy bar style phones. My preference is definitely for the flip phone. You will have the latest models to choose from and get the best deal if you buy online from the company website.